Here’s a great little flowering plant to add to your perennial garden. Coneflowers are native to the prairies of the central and eastern United States. The early Native Americans recognized coneflower (genus Echinacea) for its medicinal value, and even today echinacea cough drops and immune booster tablets are readily available in drug stores. In terms of its value to you the home gardener, coneflower is a no-nonsense, undemanding, low maintenance, and very attractive little beauty to mix in with other flowering plants or to cluster together in a stand-alone bed of coneflowers. So, what do coneflowers need in order to perform for you? Mostly just a sunny location in a well-drained soil. The coneflowers grow on tough little stems up to and sometimes exceeding 3 feet in height. Blooms are produced from mid to late summer, and are a favorite of butterflies. 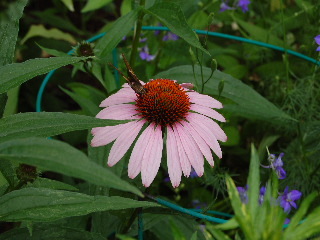 Coneflowers are mostly white, pink, or purple in color--with purple being the most commonly seen. As the blooms dry and fade into the fall and winter months, songbirds (especially finches) are drawn to your garden to feed on the drying seedheads. After a period of hardy growth in your garden (2 to 3 years), your tough little coneflowers should have put on enough “clumping” so that you can dig, divide, and replant the clumps. What a great way to add even more of these great little beauties to your perennial garden.